Thugger isn’t taking his mentor position lightly. Young Thug has been killing the fashion game for a while now, but this year has been one for the books. Thugger was one of the faces for Calvin Klein's Fall collection, modeled tracksuits for the latest Puma campaign, and his cover for his JEFFERY album made waves in the fashion and rap worlds alike. 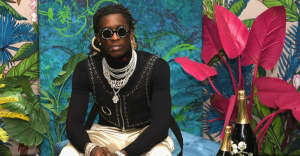 Young Thug was recently called on to mentor designer's for VFILES Runway's Season 7 fashion show, and he more than delivered in his leadership role. During the show at New York Fashion Week on Wednesday night, Thug stopped one model in the middle of the runway in order to make some last minute adjustments to the outfit. Watch the video above and see more pictures of Young Thug at show below. Read the full story behind Young Thug's iconic JEFFERY cover from The FADER.